Liverpool or Egypt, the goals keep coming from Mohamed Salah. He can even afford a penalty miss or two. Salah scored twice — he also had two penalties saved and two assists on a frenetic night — as Egypt beat Niger 6-0 in African Cup of Nations qualifying on Saturday, a resounding victory that might be enough to ease the Pharaohs’ World Cup heartache. 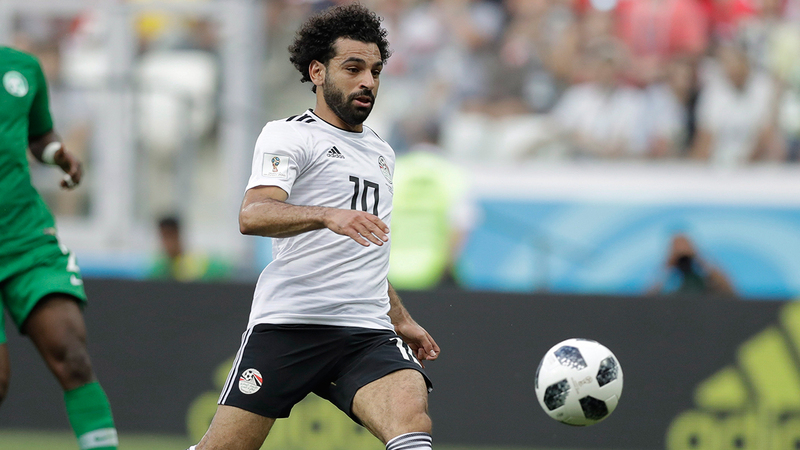 Egypt lost all three of its games at the World Cup, a miserable campaign compounded by a bitter falling out between Salah and the Egyptian soccer federation. Salah put that to one side against Niger in Alexandria to help lift Egyptian spirits and lift the team to second in its group behind Tunisia, good enough to qualify for the African Cup next year in Cameroon if it stays there. Salah was the hero, even after the penalty he earned 60 seconds in and took himself was saved by Niger goalkeeper Kassaly Daouda. Salah saw his second spot kick also blocked by Daouda later in the first half but this time he reacted quickly to hammer the rebound home. That made it 3-0. Before that, Salah had already set up Marwan Mohsen for the opener in the 13th minute, and Ayman Ashraf put Egypt 2-0 up. Salah had a second assist for substitute Salah Mohsen’s goal and 4-0 in the second half. The Liverpool forward headed in for his second goal with five minutes to go. Mohamed Elneny got the sixth in injury time. Nigeria did without captain John Obi Mikel to win 3-0 in Seychelles and start its own healing from a painful World Cup experience. The pain was felt by all five of Africa’s teams at the World Cup, with none making the knockout stage. Nigeria came desperately close, eliminated by an 86th-minute goal by Argentina in their final group game. Ahmed Musa and Kelechi Iheanacho set up Nigeria’s win in Seychelles, although neither got on the scoresheet. Musa’s early shot rebounded off the crossbar and back in off the Seychelles goalkeeper for an own goal. Iheanacho hit a free kick that struck the post and fell to defender Chidozie Awaziem for a simple finish. Odion Ighalo’s second-half penalty sealed Nigeria’s win on the artificial pitch at Stade Linite. Nigeria — without Mikel and other key players because of injury — collected a first victory in the final round of qualifying having started with a home loss to South Africa last year. Ghana’s team morale appeared affected by months of crisis in its soccer association when it lost 1-0 to 10-man Kenya away in Nairobi. The Ghanaians, a notable absence at the World Cup in Russia having reached the quarterfinals as Africa’s fairytale story in 2010, fell behind to a Nicholas Opoku own goal. They had a man advantage for the last 30 minutes after Joash Onyango was sent off but couldn’t find an equalizer, meaning they lost their lead in their qualifying group. There are fears for the immediate future of Ghanaian soccer after the government tried to disband the entire national federation, accusing it of deep-rooted corruption. The country narrowly avoided a ban from internationals by FIFA, and soccer in Ghana is on its knees and now being run by a temporary committee. Cameroon, the defending African champion, has already qualified for next year’s tournament as host. But in the face of such a big moment defending its title at home, the team is competing in qualifying to stay sharp. That seemed a bad idea on Saturday when Comoros, population 795,000, led the continental champion 1-0. Stephane Bahoken saved Cameroon with a late equalizer and saved new coach Clarence Seedorf, the former Netherlands international, from a humiliating start. Mauritania, yet to make it to a World Cup or an African Cup of Nations, is on course for history after a 2-0 win over Burkina Faso, which was the African Cup runner-up in 2013. Mauritania leads the group. Libya also tops its group after drawing in South Africa 0-0. Another high flyer is Burundi. Next year’s African Cup will be the first with 24 teams, up from 16.